Information/Data/Facts : An old wives tale said if you don't hold your breath while you pass a graveyard/step on a grave that you may inhale the soul of that deceased individual. 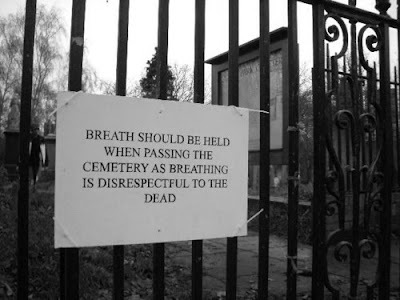 Though there are other's that say that it's in respect to the dead since they are no longer breath (making it rude to breathe as you pass by). Also, if you manage to keep your breath held than you can make a wish and it will come true. Most people in this world believe in some sort of superstition or myth. There are many phobias and myths to chose from. People have a fear of the dead, a fear of being possessed, or afraid of dying. Some people take this step of holding their breath to avoid the consequences or the questions in their minds, they don't want to question whether they will live or die. It is said that 26% of our population believes in holding their breath when passing a graveyard. Placing a cross made of iron on a burial site will keep the spirit of a person in their grave. Make sure windows and doors are open after a person died to ensure their spirit a speedy journey to the other side. It’s been said never to cry on a dead person because if the tears fall on them, it makes it harder for the spirit to leave this world. Midnight has always been considered the best time to contact a ghost and on the day they died. If you take too long to bury the dead, they will find someone to take with them. Point Of View/Experience: I believe in this superstition. I do believe that if you hold your breath while passing a graveyard that it is more respectful for the dead also, sometimes some graveyards that are no closed off, and are open to the public without a fence freak me out. I feel like they may come back to live and kill me, so therefore; I hold my breath and do as the superstition says. I do believe that people may have different religious beliefs and that can play a part in why they may hold their breath. Question at Issue: Is this really going to save your life? Do you hold your breath? People throughout their lives commit sins, we do wrong. People live, people die. It is a natural occurence that we cannot avoid. Some die young, some die old. But truth is, we all will die. Some people believe in buring the dead to an afterlife, or giving a proper burial. We do not want to offend those who do have these belifs. Some can take offense to those who make a joke out of holding their breath for the dead. So, we are left to ask ourselves, Will this really save my life, or is this just a myth that will not affect my life? I guess it is up to your interpretation.......Do you dare?!?!? Interpretation/Inference: After observing a friend do this in the car with me, and research on the internet; I can conclude that many people really do have superstitions that they believe in and take part in. This one is no different. Some really do feel that if they hold their breath then their loved ones may be laid to rest peacefully, that spirits won't enter their bodies and cause harm, or that their wishes will come true. A good solution to this is if you are brave enough, give it a shot, try not to hold your breath the next time you pass a graveyard, and if you never hold your breath when passing a graveyard, open your mind, hold your breath and if you hold it long enough to fully pass the graveyard, make a wish. You never know, it may come true. Very interesting! I have never heard of this notion before. I am not sure how I feel about souls existing on Earth after one has passed away, but graveyards do creep me out. Due to the creepiness factor, I can see why one would be tempted to perform a superstitious ritual while passing a graveyard. However, I personally doubt that the dead really care whether or not we breathe, and most likely want us to breathe (if they can see us), as we have no other means of survival. Either way, I'm just glad that cremation is an option for those of us who want nothing to do with graveyards, now or in the afterlife. When I was younger I used to believe this superstition! Whenever I would drive up north I would pass by this one cemetery by West Orange. The special thing about this cemetery was that it was so extensive and that the parkway is actually built on top of it. When this part of the parkway was being built, they had to move many of the graves. I felt disrespectful for the dead but I just couldn't hold my breath for that long anymore! :) Great post!